You like your coffee good.. I know, we’re the same. When I first started making good coffee at home I bought myself a little blade coffee bean grinder – It wasn’t long though before I realized how this just didn’t help me make good coffee. To make great coffee you just have to step up from a blade grinder to a burr grinder… unfortunately most high end burr grinders are big and cost a lot of money. If you’re anything like me you’d love to have a big Baratza Virtuoso grinder or even a Breville Smart Grinder Pro but those pieces of equipment are just too big and expensive for most people, myself included. The obvious solution to not having pockets deep enough or kitchen counters big enough to buy those types of grinders is to buy the best small electric coffee bean grinder you can find and afford. In this article we recommend to almost everybody to go get a “premium” entry level grinder, the grinder I use daily in my own kitchen at 6am is the Capresso Infinity 565.05. It is a great entry level grinder that performs really well. It’s quiet for a grinder, doesn’t produce much static, and it’s been pretty easy to keep it clean over the months I’ve been using it. The smallest of them all (and usually the cheapest) is the Cuisinart DBM-8 Supreme Grind. It’s not the best unit but it is made by a major brand and it does get the job done for only a small amount of cash. Here at GGC Coffee we have lots of customers with many different budgets, both small and large. These smaller burr grinders however are the most common units we recommend to our customers and they are the most common grinders our customers purchase. Pricing for grinders in this space typically fall between $30 and $130 and the quality of the grinder is going to go up significantly as you get over $100. Even in the low hundreds however these are still considered beginners grinders compared to models that can run in excess of $500 or even a grand! Take a look below for more detail. 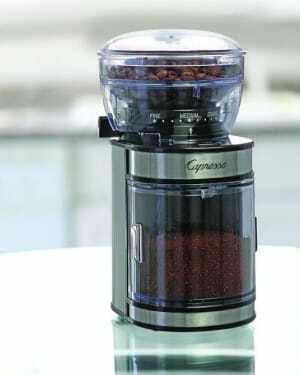 It grinds beans to an excellent level of consistency compared to similarly priced grinders. We also love that you can set your grind coarseness and grind time in advance meaning your morning brew is made effortlessly each time without any deviation at all. 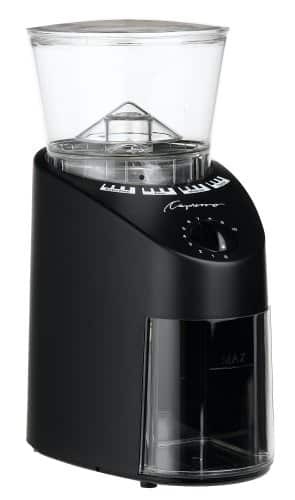 Capresso 560.01 Infinity Conical Burr (small)The Capresso Infinity is another really well made upper-entry level electric coffee grinder. We love that it makes everything from ultra fine Turkish grind to coarse french press grind. We also love how easy it is to take apart the bean hopper and movable burr to clean it out! 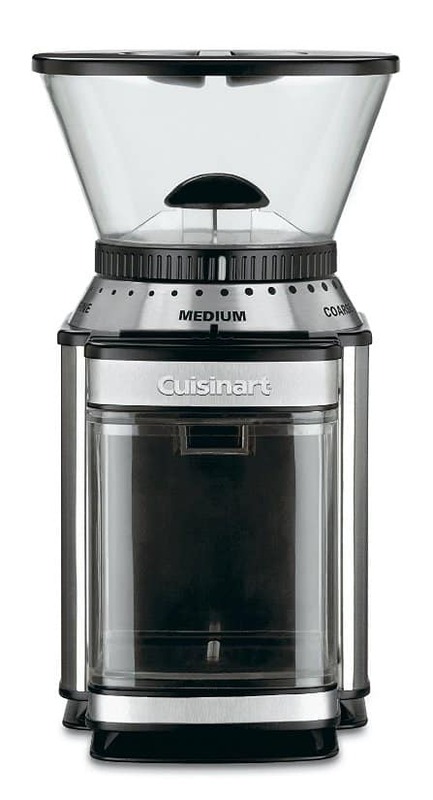 Cuisinart DBM-8 Supreme Grind Automatic Burr MillThis Cuisinart electric burr grinder is one of the best sellign grinders of them all! Why? Because it performs WAY better than a blade grinder for almost the same super low price! This is not the best electric grinder but for the price it’s perfect for almost anyone even on the slimmest of budgets. Ohh yeah, it’s really tiny too! 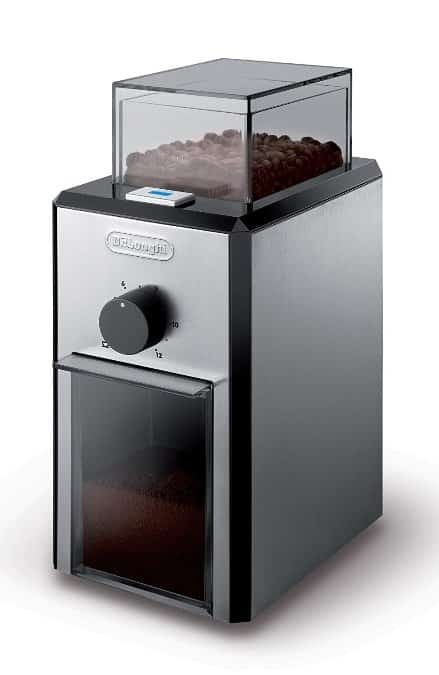 DeLonghi Stainless Steel Burr Coffee Grinder with Grind Selector and Quantity ControlIf you are looking for a small and stylish electric grinder this DeLonghi is a great, low cost option. It’s one of the smallest electric grinders on the market and it’s got stylish rectangular lines to match. If you are looking for something that doesn’t cost a lot of money and isn’t going to take up much space then this grinder is hard to beat outside of picking up an even smaller manual hand crank grinder. There’s nothing wrong with shopping around. If your pockets aren’t deep enough for a Virtuoso or Encore then any of these smaller (cheaper) burr grinders should get you started in the right direction. The best way to get great-tasting coffee right in front of you on a daily basis (without having to pay a premium at a local cafe) is to grind your own coffee beans at home. Not only are grinders fairly inexpensive, but they’re also fairly easy to use and the newer models can often double as coffee makers or even espresso machines. Unfortunately, buying a coffee grinder and choosing the right one isn’t as easy as making the decision of brewing your coffee yourself. And, when you do decide to go shopping for your own grinder, you’ll first end up having to choose between blade or burr coffee grinders. We would be amiss if we didn’t advise you to stick with the burr models only. Related: See our reviews of the best blade grinders here. Of the two, most people end up buying the former, which sometimes is the wrong choice, especially since small electric burr coffee grinders are so obviously the better choice if you want your coffee to taste it’s best. Now, this isn’t to say that blade coffee grinders aren’t good for anything, but if you’re going to spend your money on coffee accessories you may as well get the best options even if it cost you $10-$20 more. Above we’ve listed a few small entry level units that should do just fine for the average person. I’d also like to recommend you read this full article on the differences between blade and burr grinders to get a better understanding of the reasons that burr grinders are worth spending more to own. You can also keep reading to get a summary of that article. Why Are Burr Coffee Grinders Better? The answer to this question is rather simple and it all boils down to how electric burr coffee grinders are able to grind coffee beans to much more consistent particles compared to their bladed counterparts. Coffee lover or not, it’s definitely recommended to go buy a burr coffee grinder, even if they may be a bit more expensive. The smaller units are priced very attractively in most cases and they can still be used for a plethora of kitchen tasks. In the end this minimal expense is nothing when you can get the best tasting coffee possible at all hours of the day or night. Yes, we do want to see you swing by our coffee shop but we also know that brewing good coffee in the home is important too. Looking for In Depth Comparisons of These Small Coffee Grinders? Above you will find our quick review of each of the main options in the entry level burr grinder space. They are all conical burr grinders and some of them use ceramic burrs whereas the other half use stainless steel burrs. The cheaper grinders typically have plastic body components and plastic containers whereas the more expensive models tend to have stronger and quieter motors, steel casings, and glass containers. More expensive models tend to grind to a more consistent size and create less dust or shredded beans. They are also usually easier to open up and keep clean. The most popular models sold are on the low end of the price range, the Cuisinart DBM-8 and the Krupps GX5000. You can see our direct head to head comparison of the Cuisinart DBM-8 and the Krupps GX5000 here. The better performing models in this group are the Capresso Invinity 565 and the Baratza Encore. You can see our head to head comparison of the Capresso Infinity and the Baratza Encore here. 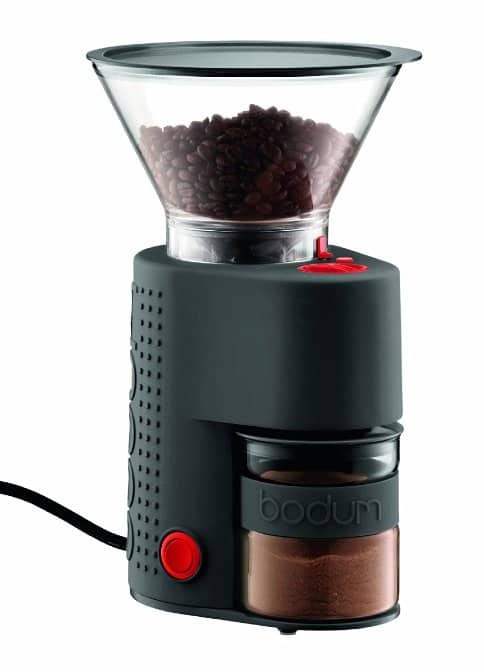 Lastly, I recommend see the following post comparing the Krupps GX5000 to the Bodum Bistro Burr Grinder to understand what performance upgrades you get by jumping up in price from the low end to the high end.